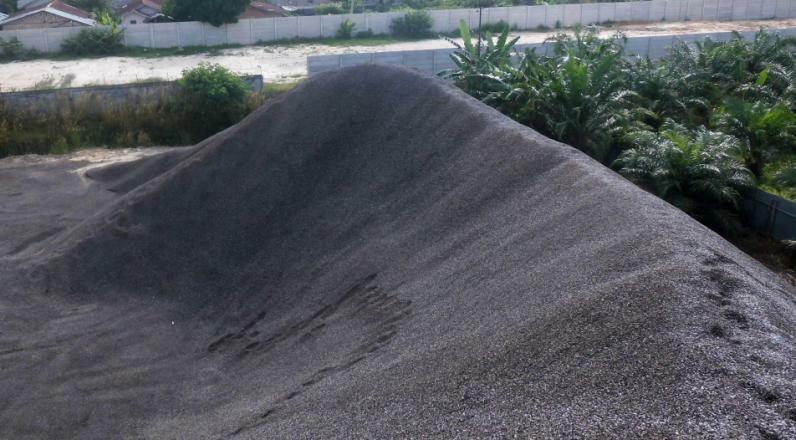 Most of the PKS (palm kernel shell) are currently only bedded on an open yard (stockpile) for storage. These conditions make it very affected by weather conditions. When the hot weather on the outside of the PKS pile is dry, but the inside is still wet. PKS bed can usually reach a height of more than 5 meters. The higher the bed will be more difficult to reach the conditions inside. When the rain conditions on the outside of the pile become wet, but the inside drier. What happens to the PKS bed in both rain and hot weather? As an organic material, biomass can also decompose either by physics, biology or chemistry. All biomass is no exception include PKS will decompose over time emmit some toxic gas and reduce oxygen concentration, such as carbon monoxide (CO), carbon dioxide (CO2), and methane (CH4). As a product or commodity to be sold then the decline in quality and quantity due to the decomposition process as much as possible to be avoided. Good handling from PKS collection, cleaning and storage will minimize the decomposition. Biological decomposition that mainly occurs in the pile of the PKS. A number of organic materials as PKS impurities such as fibers, oils and so on will be easy to decompose biologically. Microbial activity in the PKS bed encourages the fermentation of organic matter. The softer and higher water content of the organic material will be decomposed biologically quickly, namely the fermentation. PKS itself is a hard material with high lignin content so it is not easily fermented in a short time. So how about a pile of PKS that is left for months and even years? What microbial activity happens? And how much the decline in quality and quantity? In compost production, the production of CH4 or methane is usually related to biomass anaerobic decomposition, whereas CO2 is more in aerobic decomposition. The higher the temperature the CO / CO2 ratio is also greater. As the temperature increases, both CO2 and CH4 are also increasing, and CH4 becomes larger than CO2 at higher temperatures. In comparison, namely with the storage of wood pellets. The similarity of PKS with wood pellets is the same biomass fuel that has nearly equal calorific value and can be pourable so it is possible for automatic feeding with very accurate calibration. Wood pellets are made or produced by densification of wood powder in general the size of sawdust with a moisture content of 10%, being 10-30 mm in length and 6-12 mm in diameter. Wood pellets should be stored in a dry space and protected from water / rain. 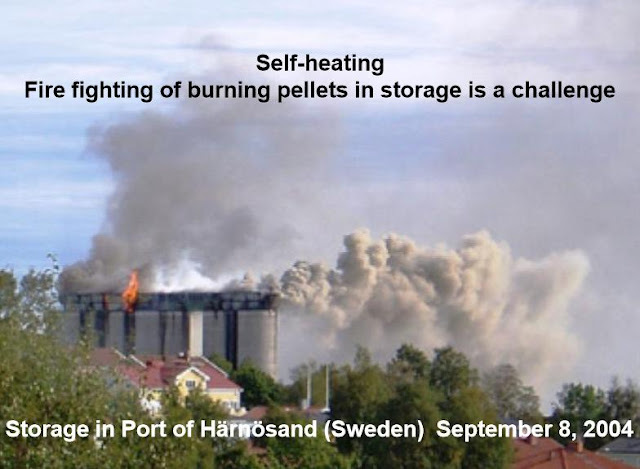 Storage of wood pellets in large quantities ie at a capacity level of 30,000 tons and above, can cause its own problems. Storage of large bulk wood pellets above proved to generate harmful and self-heating gas emissions. Resins in the form of sugars and organic compounds in the wood through the wood pellet production process, begin to break during shipping storage. Wood pellet producers must prepare the best product so that acceptable buyers across oceans satisfactorily. Preparation of raw materials in the form of natural wood drying after being felled is being tested to minimize gas and heat emissions during storage. The reason behind the method is that wood tends to have varying water content every year, so that natural wood drying will reduce the breakup of chemical compounds in wood chips and sawdust. 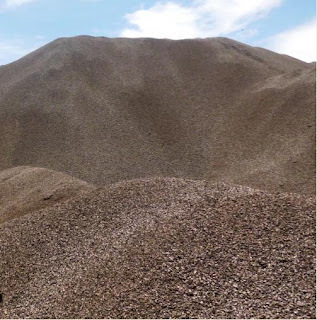 The spontaneous heat from wood chip and sawdust piles resulted from the oxidation of unsaturated fatty acids (unsaturated fatty acids) and other extractives. A cargo ship carrying wood pellets in closed room reportedly detected a concentration of carbon monoxide (CO) of about 1% (10,000 ppm) on the 18th day after loading (loaded). The oxygen concentration at that time also became less than 1% and the carbon dioxide emissions from the wood pellet pile were 100-885 mg / ton / day. And it is well known that high concentrations of carbon monoxide (CO) are very dangerous and should be avoided. An analysis says that the gas is formed from auto-oxidation of fat and fatty acids in the wood, but the factors driving the gas production are not fully known. A fatal accident occurred at the port of Rotterdam in 2002 and the port of Helsingborg in 2006 contained safety issues of serious concern. Plus fatal accidents happen again in Finland and Germany, safety issues become increasingly prominent. Carbon monoxide poisoning (CO) has killed 5 people and severe brain injury for some people. 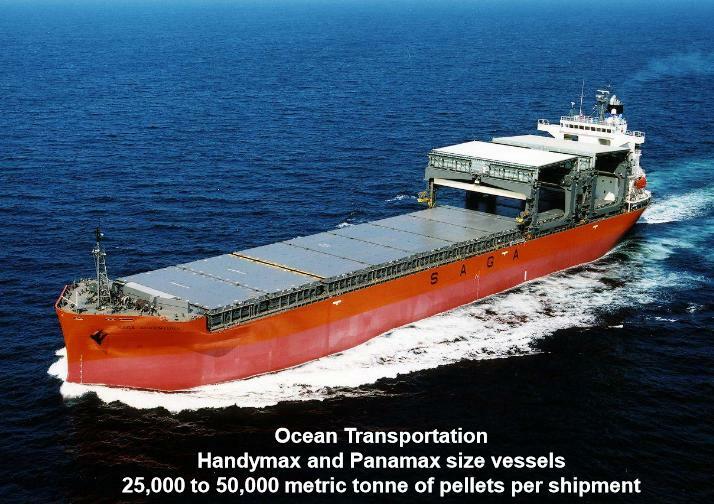 In 2005 IMO (International Maritime Organization) also incorporated wood pellets as a hazardous material due to the formation of carbon monoxide (CO) gas that causes oxygen deficiency. Instruments such as oxygen-meter or CO-meter detection or instrumentation are required for the crew or personnel dealing with the wood pellets. Aeration with inserting the adequate air (ambient water) in the pile of wood pellets into a solution for storage of wood pellets. The purpose of wood pellets aeration is to cool the pellets, regulate the temperature on the pile of pellets, prevent biological heating on wet pellets, circulate gas emissions, and eliminate odors generated from gas emissions. The speed of chemical reactions deterioration or decline in quality becomes very slow and sometimes insignificant at low temperatures. 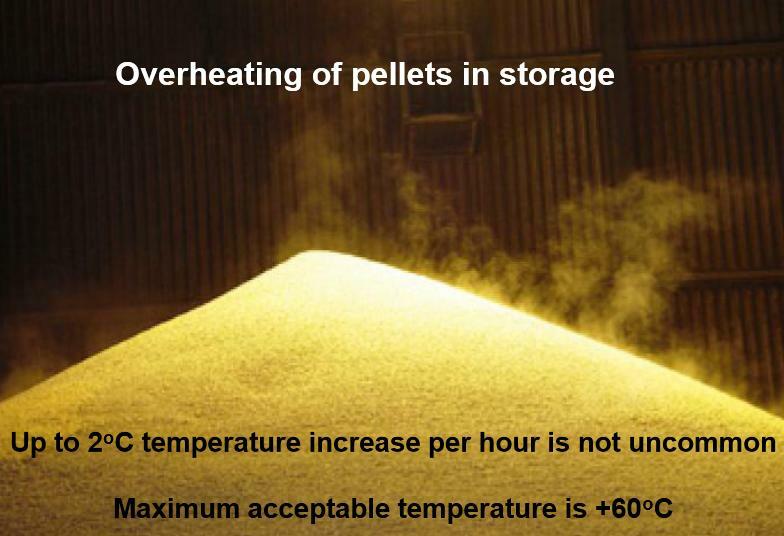 The increase in chemical reaction is noticeable every 10 ° C temperature increase, so keeping it at a low temperature is essential in wood pellets storage. PKSThe PKS pile in open spaces does not pose any significant problems with harmful gas emissions. This is because the harmful gas emissions soon break down in the atmosphere because it is in open space. While the heat will cause safety problems for workers who manage the pile of the PKS. The higher the bed and the more organic impurities the higher the oxidation and fermentation rate. The temperature in the pile becomes higher, reaching 70 - 80 C so it is quite hot exposed skin or feet. The PKS manager often inserts water to cool the temperature in the pile. PKS quality will be biologically damaged if the fermentation process runs for a long time, ie 6 months or more. Entering the water will cool the pile temperature which also means decreasing the speed of the fermentation reaction. Maintaining the condition of the PKS bed remains also important to maintain the quality and quantity of the PKS. The content of nitrogen (N) elements in the PKS can also be used as a benchmark of how big the degree of fermentation in the particular PKS and biomass fuel in general. Ultimate analysis in the laboratory can be to know the chemical elements in the biomass. Nitrogen (N) standards should be listed for biomass fuels which, according to the European Standard (CEN), are grouped from less than 0.3% to groups above 3%. 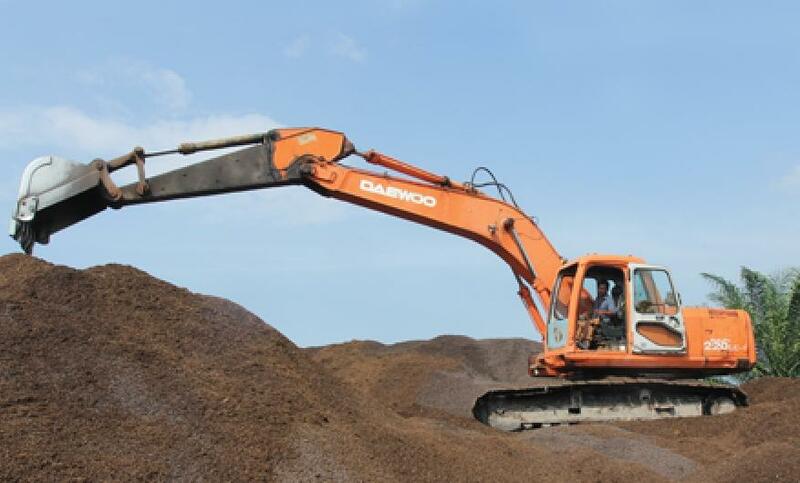 In addition, PKS managers also often aerate by flipping through the pile with heavy mechanical devices such as backhoe. Aeration will also lower the temperature of the bed due to fermentation other than that by flicking it in the presence of heat of the sun will dry or decrease the water content of the PKS. Basically the two methods above are used to maintain the quality and quantity of PKS and that is not less important is the safety.